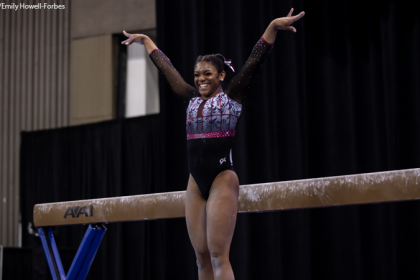 Twenty four future, current and former NCAA gymnasts will be competing in Doha, Qatar, in the 2018 Artistic Gymnastics World Championships. The competition begins October 25, with men’s qualifications and ends November 3 with the second day of event finals. Implications are high at this world championships as it is the first event at which teams can qualify for the 2020 Olympic Games. The top three teams in both the men’s and women’s competitions will earn team berths at the Olympics while the top 24 teams qualify to next year’s world championships. One current, two former and seven future NCAA gymnasts will represent six different programs in the women’s competition at worlds. Four of the six members of the U.S. team are future NCAA gymnasts. Future Florida gymnast Riley McCusker will be looking to make the all around final in her first world championships while future Gator teammate Morgan Hurd will be trying to defend her world all around title from last season. Ragan Smith, a future Sooner, will try to redeem herself at this year’s world championships after qualifying in second to last year’s all around final but injuring her ankle in the warm-up. Future Ute Grace McCallum will aim to make a few event finals in her first world championships appearance and could possibly sneak into the all around final if other top Americans falter in qualifications. The U.S. team as a whole will be looking to win its fourth consecutive team title and secure a spot at the 2020 Olympic Games. 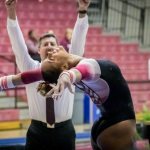 Alabama freshman Shallon Olsen, also a 2016 Olympian, will try to replicate her 2018 Commonwealth Games success at these world championships. In Gold Coast, Olsen captured gold medals on vault and in the team final and earned a bronze medal on floor as well. After mistakes in the vault final at last year’s worlds and the 2016 Olympics, Olsen will be looking to not only make the final but compete two hit vaults as well. 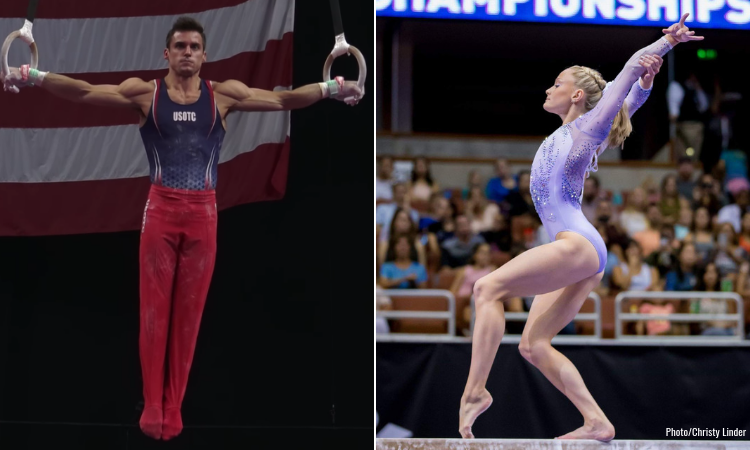 Two former U.S. elites will be representing other countries at this year’s world championships. UCLA commit Frida Ezparza will help lead the Mexican team after winning the Mexican national championship earlier this year while future North Carolina gymnast Tienna Nguyen will be one of two gymnasts representing Vietnam. Future Alabama gymnast Corinne Bunagan, a former J.O. competitor in the U.S., will be competing for the Philippines at worlds this year. This will be the first world championships for Ezparza, Nguyen and Bunagan. Veteran Simona Castro, a former Denver gymnast, will compete at this year’s world championships for Chile. Castro has been competing internationally since 2005 and was the first female Chilean gymnast to compete at the Olympic games, qualifying in both 2012 and 2016. Former UCLA Bruin Danusia Francis will compete at this world championships representing Jamaica. Francis, an alternate on Great Britain’s team for the 2012 Olympics, will be competing in her third world championships. In 2015 she competed as a member of the Jamaican team after changing her country affiliation from Great Britain, whom she competed for at the 2011 World Championships. Check out the table below for the full roster of women’s NCAA gymnasts competing at the 2018 World Championships. *The U.S. has not yet selected which of the six gymnasts on its roster will be the alternate. Nine different NCAA gymnastics programs will be represented by 14 gymnasts in the men’s competition. The U.S. men’s team is comprised entirely of current and former NCAA gymnasts. Led by reigning U.S. all around champion Sam Mikulak, a former Michigan Wolverine, it will be looking to return to the podium in the team competition for the first time since 2014. Mikulak will be looking to grab a medal in the all around, a feat that he has narrowly missed several times before, along with reigning world bronze medalist on floor and Oklahoma senior Yul Moldauer. In their first world championship appearances, Ohio State senior Alec Yoder and former Sooner Colin Van Wicklen will attempt to make it into event finals. 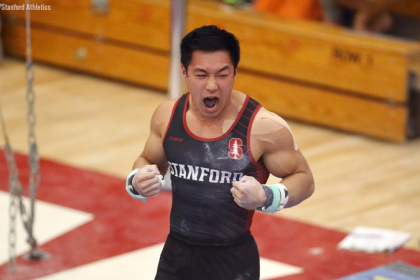 Yoder will contend on pommel horse while Van Wicklen will hope to make the vault final. Former Stanford gymnast Akash Modi will be aiming to beat either Mikulak or Moldauer for a spot in the all around final but has the potential to sneak into a few event finals, like parallel bars, as well. Canada is also sending a large contingent of NCAA gymnasts to the world championships with three on its roster of six. Penn State junior Sam Zakutney will be hoping to qualify to the all around final after a strong performance at the 2018 Senior Pan American Championships last month. Former Iowa Hawkeye Cory Paterson will also be competing for Canada, helping it try and qualify a team for next year’s world championships and continue along the Olympic qualification route. California freshman Darren Wong is the traveling alternate for the Canadian team. Australia will be relying on the strength of the Illini as two of its gymnasts, Tyson Bull and Clay Mason Stephens, are former and current members of the team at Illinois, respectively. Stephens also represented Australia at the 2017 World Championships. Stephen Lewis, a junior at Springfield, is returning to the world championships this year after competing in 2017. He will be looking to qualify for a few event finals and help the Jamaican contingent have a strong showing, potentially even finishing in the top 24 as a team and qualifying to 2019 worlds. Former California gymnast Yordan Aleksandrov, Bulgaria’s lone competitor, will hope his difficult high bar routine will help propel him into the high bar and all around finals. Check out the table below for the full roster of men’s NCAA gymnasts competing at the 2018 World Championships. *Indicates the gymnast is an alternate for their country’s team. Misha Koudinov Ohio State grad is competing AGAIN for New Zealand. Thanks, Rick, for pointing that out! Thank you for the heads up, Diane!